Chris Brown, executive editor of Auto Rental News, congratulates Doris Cassan. 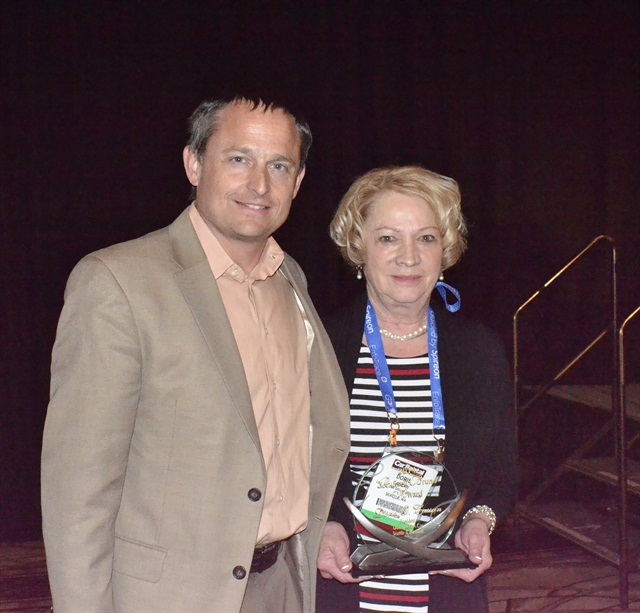 The award was presented during Tuesday’s closing seminar at the 2014 Car Rental Show at the Rio All-Suite Hotel & Casino in Las Vegas. Involved in the car rental industry for many years, Cassan served as one of the original board members with ACTIF (Association for Car and Truck Rental Independents and Franchises), which has since become part of the American Car Rental Association (ACRA). In addition, she was the first female to serve as the Car & Truck Renting and Leasing Association (CATRALA) president at a state level. Cassan and her husband James opened the first Dollar Rent A Car franchise outside of California in 1968. Since then, she has worked in every facet of the car rental business, from the customer side to the office accounting to washing cars. Recently, Cassan has been involved with legislation issues including Proposition 1 or the “Living Wage Measure” in SeaTac, Wash. This initiative would increase the minimum wage to $15 for all transportation and hospitality employees in the city of SeaTac and at the Seattle-Tacoma International Airport. Cassan, along with ACRA, opposed the initiative. Employees at her Dollar location in Sea-Tac location would be subjected to the pay hike, while her Dollar location in downtown Seattle would be exempt. “The government should not be getting involved in the day-to-day operations and employee standards of a private enterprise,” she said. In 2011, Cassan was involved in opposing Senate Bill 5958, a proposal to extend some taxes on car rentals, hotels and restaurants to pay off Seattle’s Safeco Field. Cassan helped contact legislators to oppose the bill. "Doris Cassan represents what is the best in every car rental operator: devotion to excellent customer service, devotion to staff and devotion to the betterment of the industry by working with the American Car Rental Association to further develop our mission of championing the legislative matters that affect our industry,” said Sharon Faulkner, executive director of ACRA, who presented the award to Cassan. “We thank her for giving so much back to the industry where she has always been such an integral and important member." The Russell J. Bruno Award has been given at the Car Rental Show since 2004. Recognizing outstanding service to the auto rental industry, past winners include Ken Elder, Jim Shapiro, Sandy Miller, Sharon Faulkner and Michael LaPlaca. Raymond Wagner of Enterprise Holdings received the award for 2013.